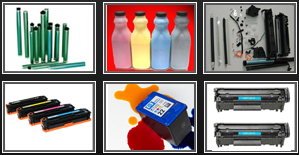 Orange Cartridge Stores offer a wide range of remanufacturing cartridges. The range includes inkjet cartridges, laser toner cartridges, and copier toner cartridges from OEM suppliers like HP , Canon , Samsung , Xerox , Epson and more. Our cartridges are a suitable fit for your printer ensuring quality prints and durable technology so that you keep printing crisp documents page after page. *All Brand names & Trade marks or Properly of there Respesctive onwer & are not related to supplaier and are used for referance purpose Only.